With so many choices, selecting tack for your horse can become overwhelming. Two matters provide guidance: whether you show in competitions with rules governing tack and sensitivities and habits your horse may have. Otherwise, your decision on whether to use a one-ear bridle is a matter of preference. The only way you and your horse may benefit from a one-ear bridle is if your horse is extremely sensitive across the forehead so that a traditional browband -- a leather strap that goes across his forehead -- irritates him. The piece that goes around the ear either is inserted over the headstall strap, allowing it to be adjustable to fit precisely over your horse’s ear, or goes through a split in the headstall for the ear. If your horse has sensitive ears, the moveable ear piece is a good because it makes it easier to avoid it rubbing his ear. The one-ear bridle’s construction is minimal. It has no noseband. Many have no throatlatch, particularly those for show. This means the bridle is not as secure as other styles of bridle and therefore is easier for your horse to remove. If your horse tends to shake or toss his head, get either a bridle with a throatlatch or another type. Horses with sensitive ears may object to the split-opening style of the one-ear bridle, as it nestles close to or touches the ear and is not adjustable. If you aren’t competing, you can use the bit you normally use on your horse with the one-ear bridle, with one caveat -- an unshanked snaffle bit, where the reins attach directly to the rings on the mouthpiece even with your horse’s mouth, must be used with a throatlatch or you increase the risk of the bridle slipping off. When you apply rein pressure with an unshanked bit, it causes the headstall to move slightly forward; without the security of a throatlatch, curb chain or noseband, it can slide off. A shanked bit with a curb chain applies pressure downward, keeping the bridle in place. 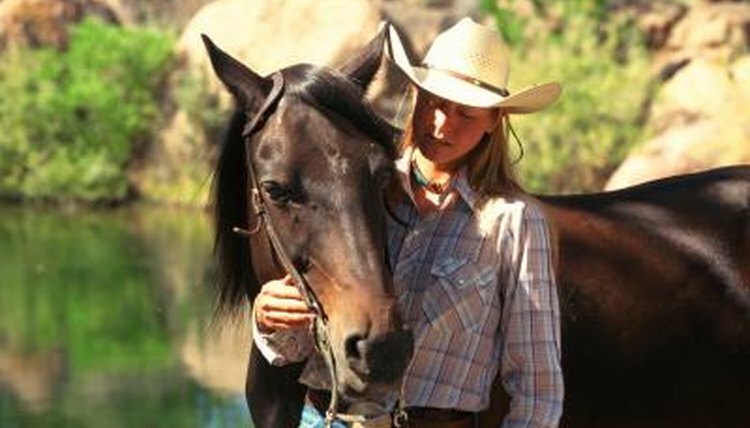 In addition to the one-ear bridle, you can buy a two-ear bridle that has an additional ring or slit for the other ear. English bridles have both browbands and nosebands, while Western bridles with browbands do not typically have nosebands. Bitless bridles are designed to work without a bit, putting pressure on the side opposite of your rein pull so your horse turns away from the pressure. Several types of hackamores, bosals and vosals are bitless headstall devices. Each uses varying degrees and types of pressure to control your horse.